You are streaming consciousness, #GoBinge. In response to an extensive consumer research survey around the bingeing behaviours of the UK (The Binge Files), Three UK have launched Go Binge, a proposition that allows customers to stream films, TV shows and music through certain apps including Netflix, TV Player, Deezer and SoundCloud without contributing to their data allowance. With the Binge Files revealing that 44% of people aged 16-24 years old watch more than an hour of streamed content on their phones daily and 46% binge because they just can’t wait for the next episode, we set out to create a short film parodying people’s newfound streaming addictions based on these insights. 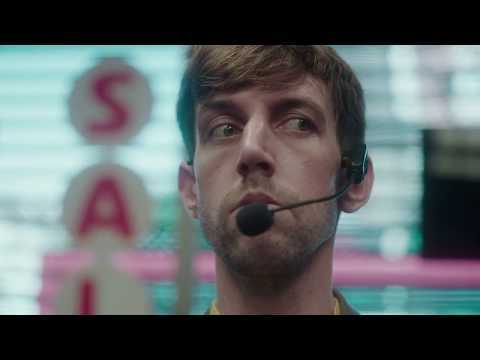 Set in an eccentric electronics store, the film sees a store owner host secret, unconventional ‘Binge classes’ after hours, encouraging people to become more in-tune with streaming and connected to their devices – to help them achieve a higher stream of consciousness.